The book I took with me on the trip is ‘The Grapes of Wrath’, by Steinbeck, and riding thorough the barren, almost desert landscape between Volgograd and Astrakhan and seeing the small villages and their wooden houses covered in dust, with haystacks that almost looked as piles of dried mud melting into the landscape, I could not help but think of that story. Seeing such a dry and dusty place and baking in the almost 40ºC heat on the motorbike, it is hard to imagine that temperatures reach -20ºC in winter and snow covers everything. Life here must be very hard. 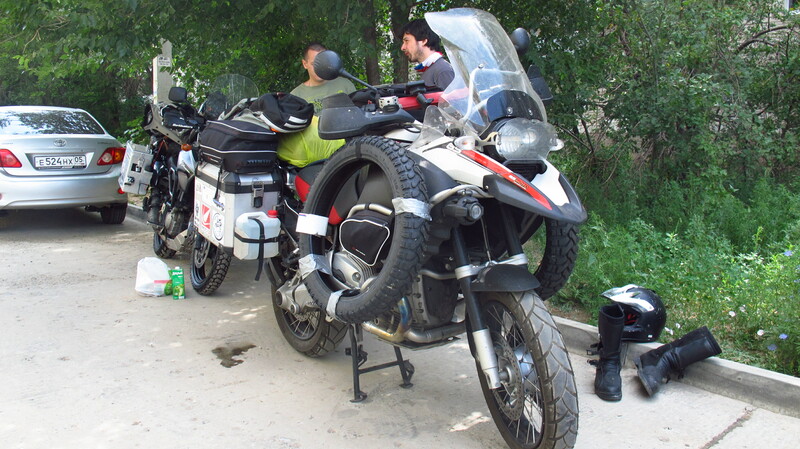 I rode with Martin all the way to Astrakhan, and it was a very nice day. I finally got some pictures and videos of myself and the bike for a change and I also recorded him. 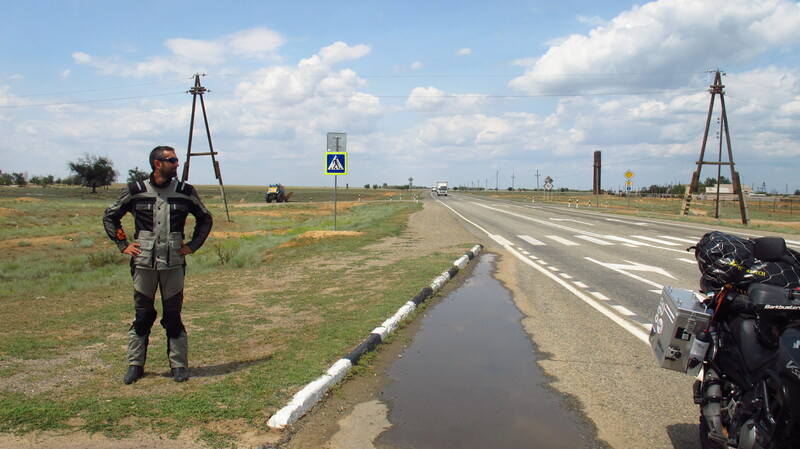 The road was very good and we made it to Astrakhan by four o’clock in the afternoon. The night before I had sent a Couch request to a couple who live in the city, and it turned out that it is the same Couch Lex, the Dutch guy is staying at, so we have met again. Valentin, the guy who is hosting us, had to work today, but there is a very active community of Couch Surfers in the city and they were very excited to know that we were here, so he organized a meeting in the center. He gave us the mobile numbers of a couple of people and told us to go and meet them. We took a 20-minute walk to the center and waited for them at the park. 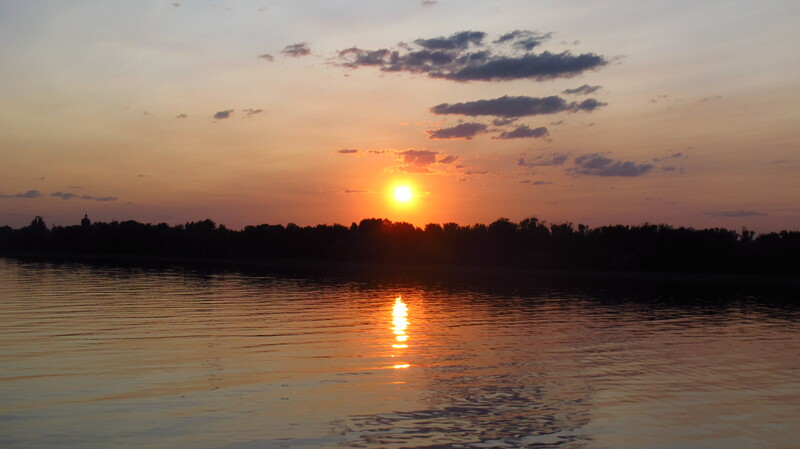 We were about eight people, and other people joined us as we walked across the center and to the river Volga to see the sunset. It seems that every time I think that a city is going to be boring or uninteresting and I am just going to sleep there and move on, it turns out to be a great place that I regret leaving so quick. Astrakhan is much smaller than Volgograd, and it is the most beautiful city I have seen so far in Russia and Ukraine. 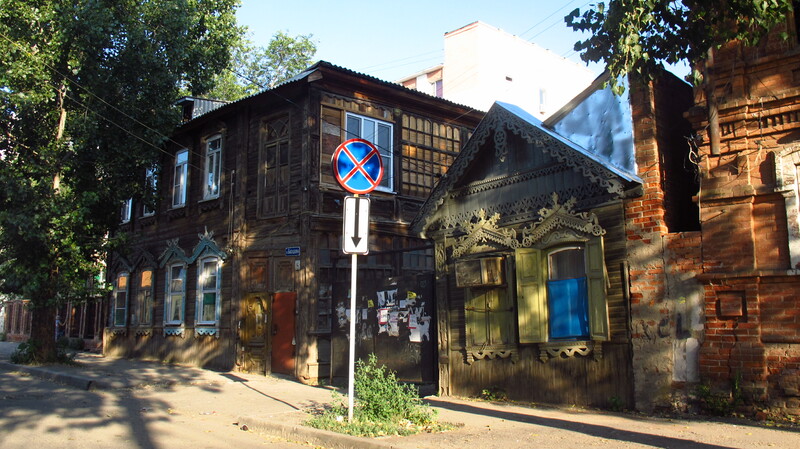 Unlike most other cities, it is well taken care of and looks beautiful, the center still has lots of old buildings and traditional wooden houses, and the Kremlin was amazing, even though we could only see the outer walls as it was closed for renovation. After a long walk we went back to the park where we had met and Martina, a German girl who works for charity and has been living in the city for 10 months, set up a slackline between two trees and we all had a go at it. Quite difficult! 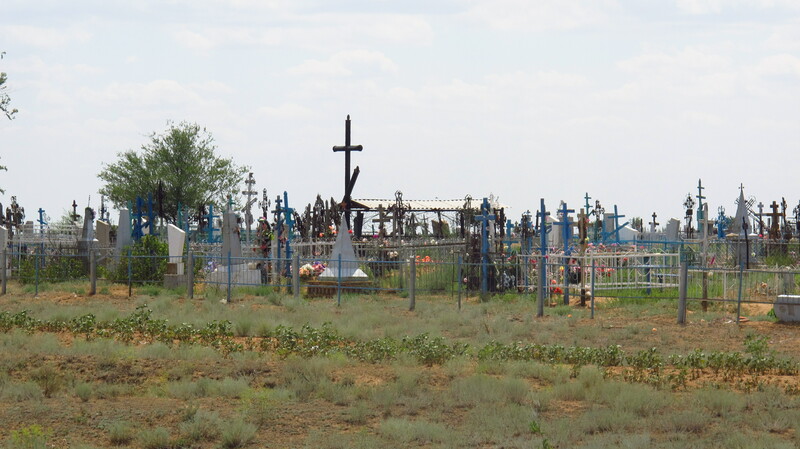 Tomorrow Martin and I are heading into Kazahkstan, which means that the easy part of the trip is over. No more beds, no more showers, no more internet. We will ride for about 400km and then camp for the night. After that, we will go our separate ways, me to the North and then the Aral sea, and him into Uzbekistan. I will keep writing, but I do not know when I will have connection to publish posts, probably not before Almaty. These first two weeks have been amazing, I have experiences so many things and met so many people it will still take some time for it all to sink in. Now the difficult part starts. See you soon. 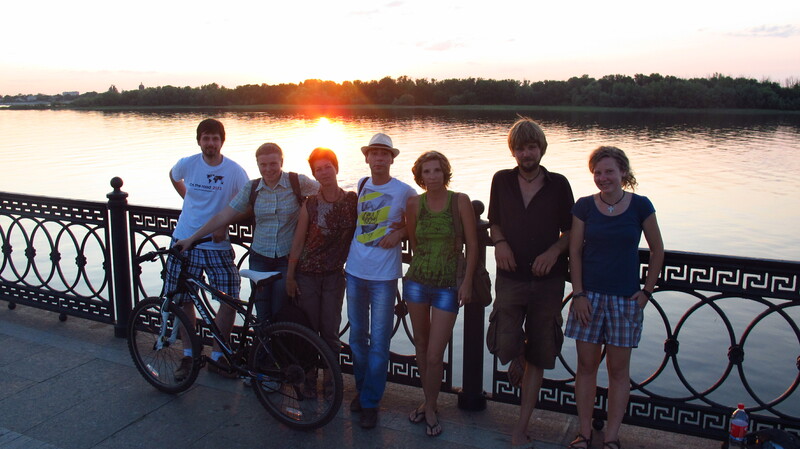 This entry was posted in Stroming The World 2013, Travel and tagged Astrakhan, Couch Surfers by Kilian. Bookmark the permalink.